Here’s an app you’ll find in all app stores done many, many times. There’s certainly plenty on Ovi Store so I thought this might be something that Nokia users in general are finding useful. #61 is Another Level. I wasn’t quite sure of it myself but had to use it the other day to level my Kinect whilst perching it on a suspended shelf. Anyway, this has 3 spirit levels, all visible at once: Horizontal, vertical and the flat bulls-eye bubble. Obviously you aren’t going to construct a house with this app, but it is useful for getting a vague indication if something is level and you haven’t got the dedicated tool on hand. The app looks nice, it similates the appearance of what you’d expect from a spirit level. 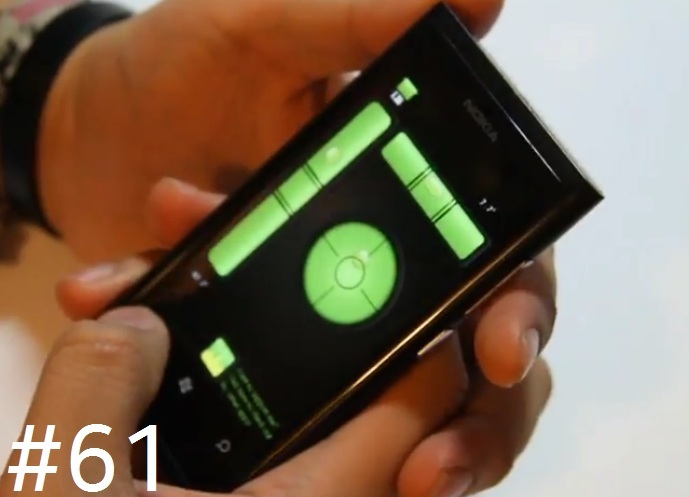 I also show another app which is Microsoft’s own basic level app. Only one is visible at the time and when you rotate, the appropriate level is shown. The one rated here is ‘Another Level’. I’d find it helpful if I could get a level shown whilst taking pictures (especially scenery photos) I’ve seen them on dedicated cams/slrs but has anyone seen a spirit level on a phone?. Update 1.2: Added a small link to my other apps. There are tons of other spirit levels, but they are either rubbish, or not free. This is a simple spirit/bubble level that’s free, doesn’t have ad’s, and looks really good. The bubbles float around and squish against the sides. « Loads of Free Gameloft Games for S^3!! !